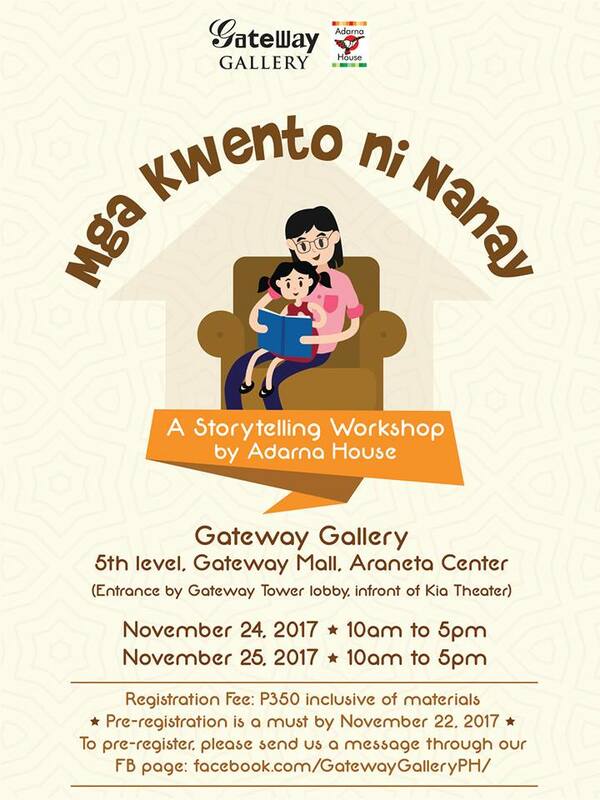 Nanay's Trip National Reading Month 2017 Celebrate National Reading Month 2017! Maligayang Pagbabasa! Celebrate National Reading Month 2017! Maligayang Pagbabasa! Magandang araw! I just found out a few days ago that elementary and high school students celebrate National Reading Month every November. 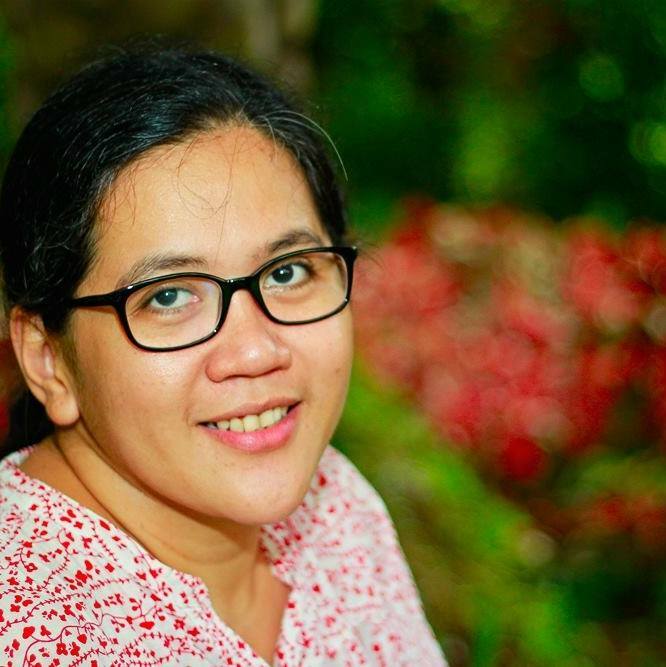 Medyo nakalagpas ito sa "nanay radar" ko pero hindi pa naman huli ang lahat. Puwede pa humabol at sumali sa mga ganap ngayong huling linggo ng November. This year, the Department of Education leads the annual celebration with the theme ""A Celebration of Arts and Culture through Reading". 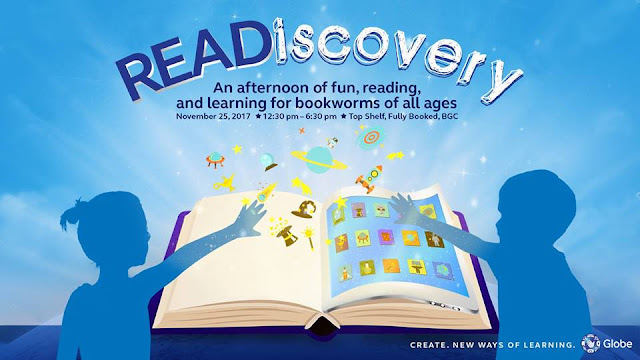 Here are some events I compiled from different Facebook pages/events/announcements that you can join to mark this year's National Reading Month. 1. Globe READiscovery (November 25, 2017, 12:30 p.m. - 6:30 p.m. at the Top Shelf, Fully Booked in BGC. Admission is FREE. "Expect a day of learning and fun: Interactive storytelling sessions, creative writing workshops, meet & greet with bestselling authors, an edutainment expo, and educational talks from the country’s leading publishers and experts in enhancing literacy and reading comprehension for children— an event for the entire family and kids at heart!" 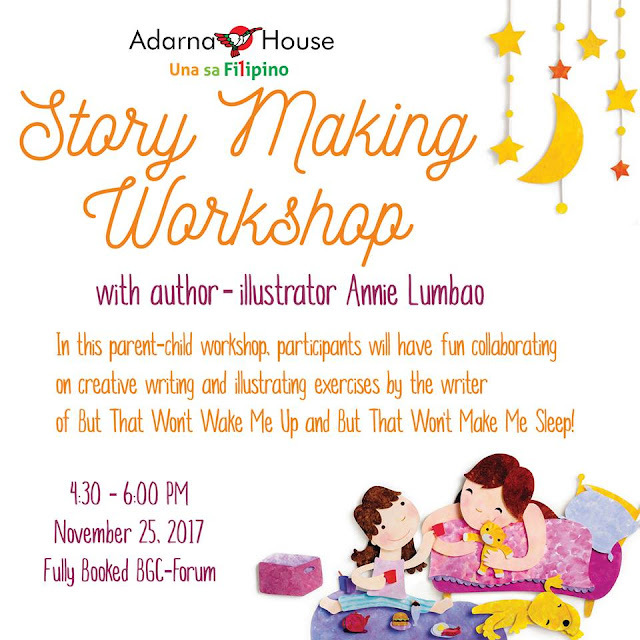 Adarna House, the pioneering publisher of children's literature in the country, will be holding two special events just for Readiscovery guests at the Fully Booked BGC - Forum. 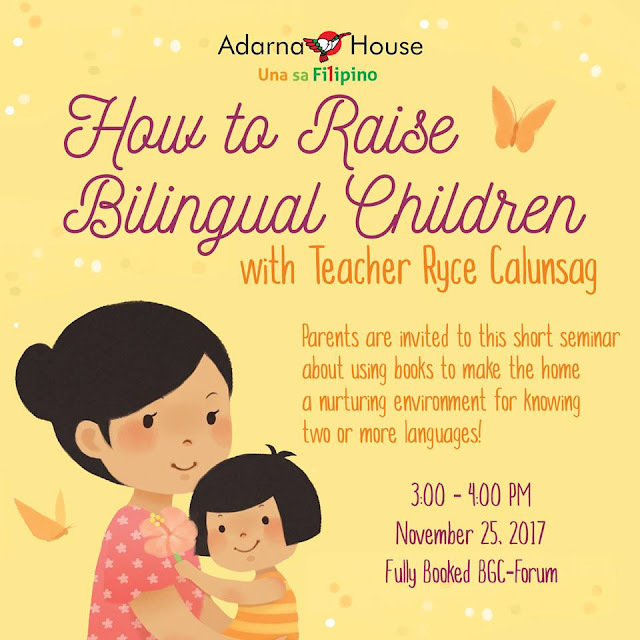 At 3:00pm, Teacher Ryce Calunsag, a reading specialist, will facilitate a short seminar for parents to share some tips about using books to make the home a nurturing environment for knowing two or more languages! After that, at 4:30pm until 6:00pm, author-illustrator Annie Lumbao will facilitate a parent-child workshop where participants will have fun collaborating on creative writing and illustrating exercises. Annie Lumbao co-authored the book But That Won't Wake Me Up! with her daughter Anelka. Both events are open to the public and free of charge. For advanced registration or for more information, email lance@adarna.com.ph. Are you a parent who wants to be a good storyteller to your kids? Or a teacher who wants to fully engage your young students? Are you looking for ways to contribute to your community through storytelling and story reading or simply someone looking for an added skill? If yes, this workshop is for you! Register early! You can also celebrate the National Reading Month by visiting art exhibits and checking out artworks done by talented artists of Ang Ilustrador ng Kabataan (INK). 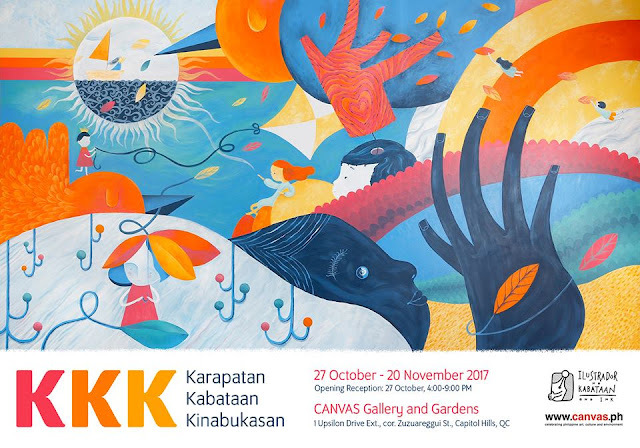 Exhibit runs from October 27 to November 20, 2017. 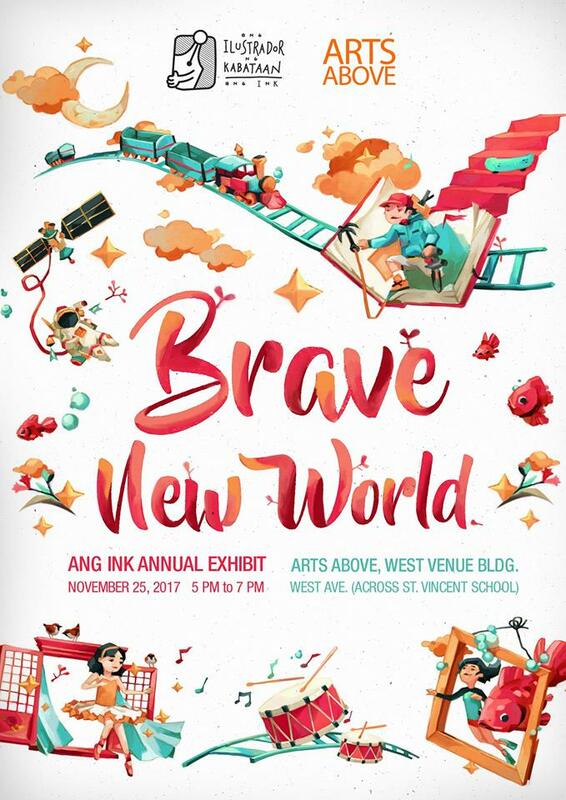 2, Brave New World, Ang INK's Annual Exhibit on November 25, 2017, 5 PM. Dagdagan ko pa ang listahan kapag may nakasalubong pa akong events sa Facebook. Kitakits! Mga mare at momshies, kung busy o iwas-trapik, wala ring problemang hindi makapunta sa mga events. Mas mahalaga at mas masaya kung Every Day is Reading Day kasama ang ating mga anak! Maligayang Pagbabasa!